The 1802G add on furnace is designed to use in conjunction with your existing HVAC ductwork and work side by side with your existing furnace. With twin 800 CFM blowers and up to 218,000 BTUs it is designed to heat a home up to 3,600 sq. ft. 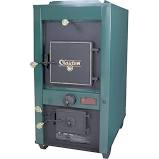 This unit is made with a firebrick lined plate firebox surrounded by an insulated steel Cabinet.